The highlights of every Computex are the creative and amazing case mods. Here are our favorites this year. If this Donkey Kong case mod by modder Thermaltake Mike (larger image here) doesn't fire off every videogame love receptor in your brain, I don't know what will. This might be the best damn case mod I've ever seen, and builds like it are the highlight of Computex every year. 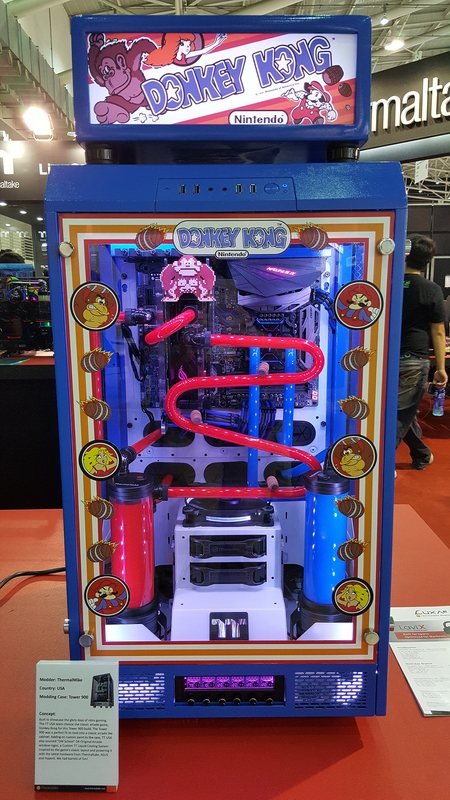 Most of Computex's booths draw crowds with flashy custom PC builds, with intricate liquid cooling and cool cases and colorful LEDs. Luckily, that means there are dozens of awesome PCs for us to photograph and lust after. Here are all the cool custom PCs we spotted at Computex, from incredibly elaborate case mods to no-nonsense perfect builds. We wish we could play Doom on every one of them. For more awesome cases, check out our Computex gallery from 2015 and last year's roundup.